Posted on 2, February 2016 by EuropaWire PR Editors | This entry was posted in Automotive, Germany and tagged Dr Dietmar Woidke, Ludwigsfelde production plant, Mercedes-Benz Vans, post-reunification success story, Sebastian Streuff, Volker Mornhinweg. Bookmark the permalink. LUDWIGSFELDE, 02-Feb-2016 — /EuropaWire/ — Mercedes-Benz Vans is celebrating a 25-year post-reunification success story at its Ludwigsfelde production plant in Brandenburg. On 1 February 1991 – just four months after reunification – the Treuhandanstalt (the agency which dealt with the privatisation of former East German enterprises) and Daimler-Benz AG founded the commercial vehicle enterprise Nutzfahrzeuge Ludwigsfelde GmbH. Since then over 660,000 vans have rolled off the production line. 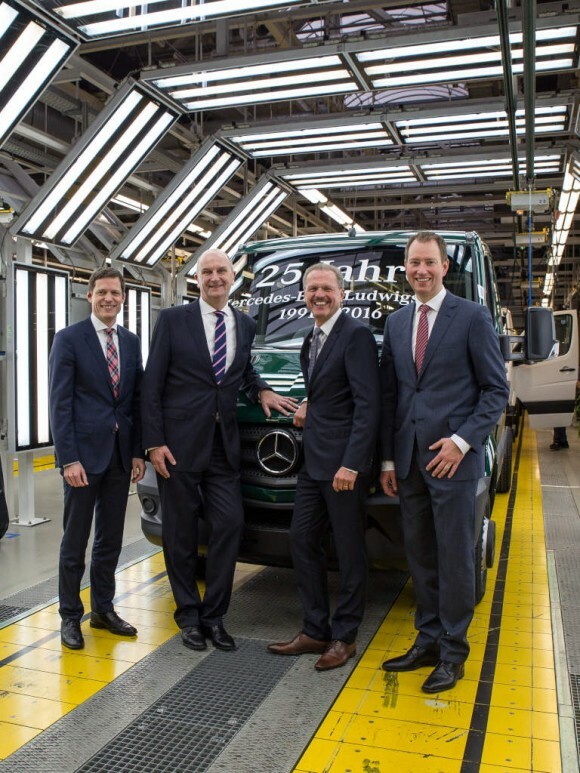 During the anniversary year, Mercedes-Benz Vans will be preparing the ground for production of the next-generation Sprinter in Ludwigsfelde and investing a total of over 50 million euros in the plant – twice as much as during 2015. This announcement was made by Volker Mornhinweg, Head of Mercedes-Benz Vans, at the celebration in Ludwigsfelde today. Guests offering their congratulations included Dr Dietmar Woidke, first minister of the state of Brandenburg, plus numerous other prominent figures from the worlds of business and politics. Volker Mornhinweg, Head of Mercedes-Benz Vans, explained at the celebrations, “The Mercedes-Benz plant in Ludwigsfelde plays a central role in our global production network today and is also a great example of a post-reunification success story. Last year over 50,000 vehicles rolled off the production line here. This played a significant role in making 2015 a record year for us.” “The plant demonstrates just what can be achieved when everyone pulls in the same direction and commits themselves fully to the task. This year we are investing over 50 million euros in Ludwigsfelde for the next-generation Sprinter. This underlines the tremendous faith we have in our on-site workforce and the potential of this plant,” Mornhinweg continued. As the only manufacturer in the large van segment to do so, Mercedes-Benz Vans will continue producing the next-generation Sprinter also in Germany – at its Düsseldorf and Ludwigsfelde sites. To this end, the division will be investing a total of 450 million euros in improving the competitiveness of the two German plants. By the end of the decade around 150 million euros will be invested in modernising the Ludwigsfelde plant, primarily its bodyshell, paintwork and assembly facilities. Daimler has invested a total of over 750 million euros in Ludwigsfelde in the past 25 years – not counting this new sum of 150 million euros. When it comes to intelligent vehicle production, the Mercedes-Benz plant in Ludwigsfelde is the frontrunner in Mercedes-Benz Vans’ worldwide production network. It is the only European production facility where open versions of the Mercedes-Benz Sprinter (platform and chassis) are manufactured for a diverse range of bodies such as construction site vehicles, camper vans or ambulances. It is Daimler’s third biggest van production plant worldwide and it extends over an area of around 540,000 square meters, with the production area taking up approximately 182,000 square metres. The Mercedes-Benz plant in Ludwigsfelde employs a workforce of around 2000, and since 1991, 1585 young people have completed their training at the plant. This makes the plant one of the biggest industrial employers and trainers in the Berlin-Brandenburg region. The workforce have shown themselves to have very strong ties to the plant, and there is a large proportion of long-term employees. Every fifth employee at the Mercedes-Benz plant in Ludwigsfelde today was part of the workforce 25 years ago and made a personal contribution to ensuring the successful relaunch of the site. This adds up to 400 of the current employees. Over the decades they have built up a comprehensive expertise in vehicle production. The radical changes in the political environment at the end of the eighties brought VEB-IFA Kombinat Nutzfahrzeuge Ludwigsfelde’s business into difficulties. With the loss of the sales markets in the former Eastern Bloc countries, production at the truck plant was mothballed at the end of 1990. The plant’s future was teetering on the brink. During this phase a close collaboration developed with Daimler-Benz AG, and this was formalised on 1 February 1991 with the foundation of Nutzfahrzeuge Ludwigsfelde GmbH. A week later, on 8 February, the first Mercedes-Benz truck (an LN2 model) rolled off the production line. The same year production of the LN1 van began. A 100 percent takeover by Daimler-Benz followed in 1994, and two years later series production of the Vario van began. Production of the Vaneo started in 2001. In 2006 Ludwigsfelde joined Düsseldorf as the second production site for the Sprinter in Germany. The Mercedes-Benz plant in Ludwigsfelde has since become the exclusive specialist in the production of large vans. 2015 was the Sprinter’s most successful year ever: in its 20th anniversary year the world van achieved growth of over four percent from 186,300 vehicles to around 194,200. In 1995 the Mercedes-Benz Sprinter established and gave its name to the large van segment, which it has shaped ever since. Sprinter vans are now on the road in over 130 countries, with well in excess of 2.9 million vehicles sold to date, making the Sprinter one of the most successful commercial vehicles of all time and a best-seller in the Daimler product portfolio. Alongside Ludwigsfelde the other Sprinter production sites are Düsseldorf, González Catán (Argentina), Fuzhou (China) and Nizhny Novgorod (Russia). The Mercedes-Benz Vans plant in Ludwigsfelde is turning 25! From left: Sebastian Streuff, plant manager and CEO at Mercedes-Benz Ludwigsfelde GmbH, Dr Dietmar Woidke, first minister of the state of Brandenburg, Volker Mornhinweg, Head of Mercedes-Benz Vans, and Frank Klein, Head of Operations Mercedes-Benz Vans, welcome a new “open” Sprinter at the end of the production line at the anniversary event.